Lois Lerner's Brief And Awful Day On Capitol Hill : It's All Politics The IRS bureaucrat showed up long enough at a House hearing into the scandal engulfing her agency to declare her innocence and her constitutional right to say no more. Lois Lerner, head of the IRS unit that decides whether to grant tax-exempt status to groups, leaves after being dismissed from a House Oversight and Government Reform Committee hearing on Wednesday. The public got its first look Thursday at Lois Lerner, who has gone from faceless IRS bureaucrat to the face that launched what feels like 1,000 congressional hearings and conspiracy theories. But it was only a brief sighting since she didn't stay long at a House hearing to further probe her role in how some IRS workers came to target conservative groups seeking tax-exempt status. The night before the hearing Lerner, who heads the IRS tax-exempt operation at the scandal's heart, made it known through her lawyer that she would invoke her Fifth Amendment right against self-incrimination and would refuse to testify or answer questions. And she did just that, mostly. She did make a short statement to declare her innocence, however. 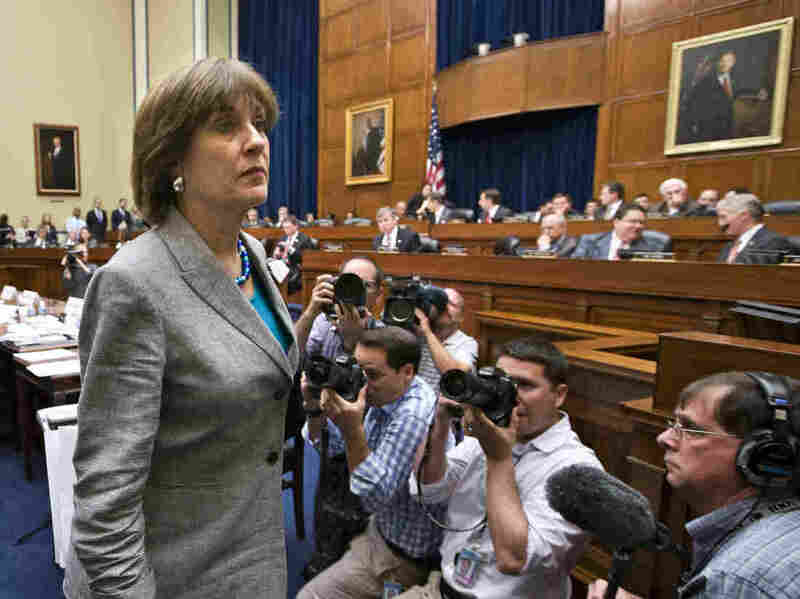 Lerner's motivation was more transparent than much of what the IRS has done in connection with this controversy. She was determined to get her side of the story out, at least the main points as she saw them. After all, she's had to endure many days of lawmakers and journalists accusing her of deception in her past dealings with them, and worse. "I have not done anything wrong. I have not broken any laws, I have not violated any IRS rules or regulations, and I have not provided false information to this or any other congressional committee," she said. There was one problem. By reading her statement and acknowledging that a document she was handed contained information she had provided, Lerner prompted some Republicans to claim she had essentially waived her Fifth Amendment right. Rep. Darrell Issa of California, chairman of the House Oversight Committee which conducted Wednesday's hearing, indicated he was seeking legal advice on the matter. Legal expert Stan Brand told NPR's Peter Overby and The Washington Post, however, he thought it unlikely a court would agree that she had forfeited her constitutional rights. In any event, Lerner's conclusions about her own rectitude aren't likely to win over many converts. She was, after all, the IRS official who answered that question at a recent American Bar Association conference — the one that made the IRS trend on Twitter for weeks now. In her canned answer to the planted question, she blamed low-level workers in the agency's Cincinnati office for targeting groups with "Tea Party" and "patriot" in their names. To say that many people found the planted-question gambit unseemly would be an understatement. That tactic apparently wasn't solely Lerner's idea: The IRS's recently fired acting commissioner, Steven Miller, told senators Tuesday he deserves blame for that one. He and Lerner had discussed how to get the details out before a Treasury inspector general's report on the matter went public. Still, the mere fact that Lerner is caught up in the scandal has genuinely surprised Bruce Hopkins, a veteran tax lawyer in Kansas City who knows her through numerous conferences where they both appeared on panels or as speakers. "Overall, I've always had a very high regard for her and I think she is far more qualified and more talented than most" IRS officials he has observed over the years, he said. "I think she's probably as good as can be gotten here for a government position like this. "That's why I was surprised to learn she was involved with something like this. It didn't fit. It still doesn't fit. I have trouble understanding what has happened." Hopkins' high opinion, earned over years of his seeing her in action, is no doubt something for her to cling to as she finds herself at the center of a storm. "Only a person lacking a sense of honor and integrity would cling to their job in the face of the horrendous damage caused to the agency they work for, to her superiors and to the welfare of the Republic if her mistakes prompt even more IRS budget cuts. "No one in this century has done more to breed disrespect for our tax system than Lois G. Lerner, undermining the public confidence on which voluntary compliance rests." It would be hard to find stronger evidence for her having become the face of this scandal than that.